Donna and Alfred left their home in Alabama to move to Oregon for a new start. 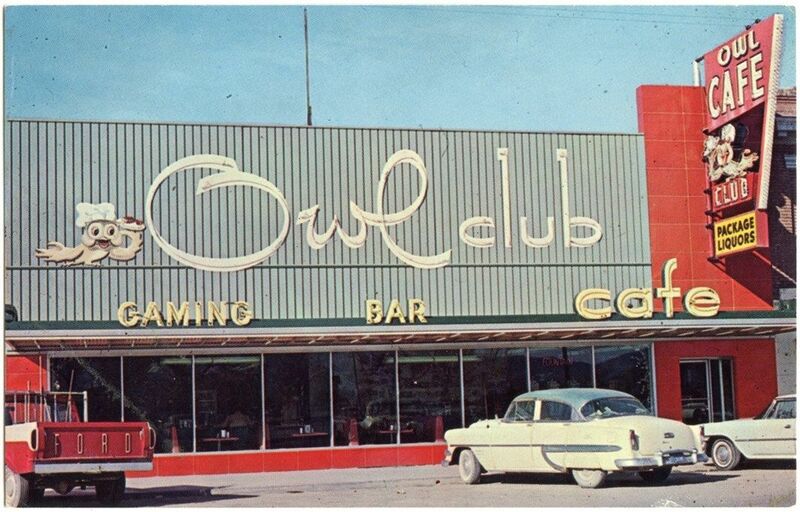 They stopped in Battle Mountain, Nevada for lunch at the Owl Club and Casino. They decided to play Keno and over the course of an evening, even though Alfred lost $109, Donna won $1700. It was St. Patrick’s Day and they decided it was their lucky day and Battle Mountain was their lucky place. Donna got a job working in the Owl Club as a waitress and Alfred got a job in the casino. He wore a vest that was too tight and walked around the casino calling, “Keno, Keno.” People flagged him down and placed their bets. Every night he’d walk through the restaurant a few times, calling for bets and he and Donna would see each other and smile. After work they’d split Donna’s tips and sit in front of their respective favorite slot machines and gamble until Donna’s tips were gone. If they ever got to over a hundred dollars with their winnings, they’d stop and go home. It only happened every month or so and never on the same night. They lived in a tiny singlewide trailer that backed up to Interstate 80. At night they were lulled to sleep by the sound of big rigs lumbering down the freeway. It was their own brand of white noise. They were reasonably happy. They had no more or less than they’d had in Alabama. Donna had been a waitress there too and Alfred had worked construction—mostly shoveling gravel—but he’d hurt his back so he wasn’t able to work that job anymore. Donna still dreamed of going to Oregon sometimes. She had a cousin who lived there and she longed for the mild weather on bitterly cold days in the high desert. 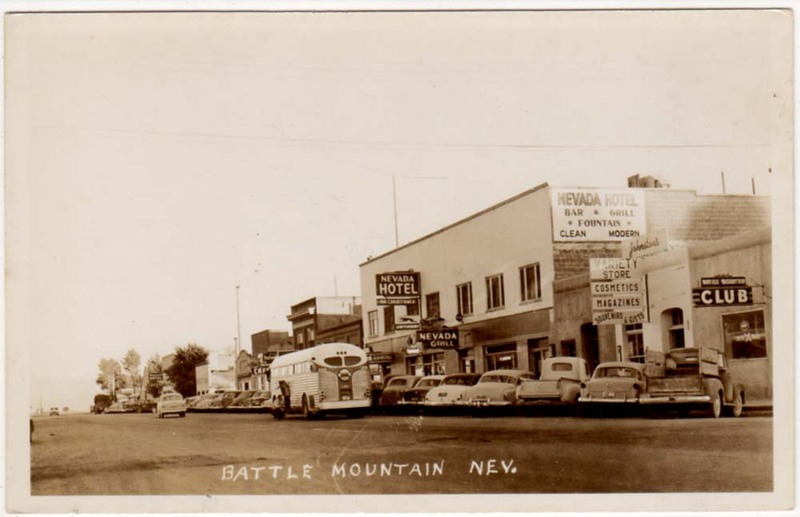 But the longer they stayed in Battle Mountain, the easier it was to keep staying there. Every year on March 17, St. Patrick’s Day, Alfred and Donna would gather the small savings they'd hoarded all year. With ceremony, after work, they’d find a table in the bar and carefully select numbers in Keno to win big. They never won big. Some years they didn’t lose big, so they considered that a consolation. Perhaps there were better uses for their money; Alfred knew that. As Donna said though, “When’ve we ever been smart?” Then she’d laugh and Alfred would feel like the luckiest man alive. Life with Donna was plain fun. After work, Alfred liked to sit in the coffee shop and wait for Donna to finish her side work, the tasks she had to complete after her shift. She’d sanitize the coffee pots and refill the salt and pepper and sugar shakers, all the while, she’d keep up a lively banter with Amy, the graveyard waitress. Amy was young enough to be their daughter, almost young enough to be their granddaughter. She seemed older than her years though. She had hooded eyes and a permanent furrow between her brows. She had a little son, Kenny, who she would carry into work every night. Kenny’s dad, Mario, was a cook during the swing shift. Amy would hand Kenny over to his dad, then work her shift. As far as anyone could tell, the relationship between Mario and Amy was a volatile one. They usually yelled at each other a bit in the kitchen and then Amy would manically smoke several cigarettes in quick succession before she was ready to start her shift. Donna didn’t seem to mind picking up any slack for Amy. The other waitresses on the swing shift would leave as soon as possible but Alfred could tell that Donna felt a motherly inclination to help Amy. And it was plain to see Donna was crazy about Kenny. She’d take him from Amy if she wasn’t too busy. She’d rub his feet if they were cold. Amy didn’t seem to ever manage to put anything on Kenny’s feet. One Saturday night Donna was finally finishing a long and busy shift. A busload of high school basketball players arrived just as she had poured herself a cup of coffee. Amy was doggedly distributing menus to the noisy crowd. Apparently they had won because they were in a buoyant mood. Donna gave Alfred an apologetic glance because she knew he was tired too and she rose to help Amy. She refilled water glasses and delivered plates of hamburgers and French fries to the hungry kids. She didn’t bat an eye when Amy lied to the first kid that asked for a milkshake. “The machine is broken,” Amy said. The basketball players groaned and Donna thought Amy was a genius. They’d be dishing up scoops of the rock hard ice cream all night to turn into milkshakes if not for Amy’s fib. Alfred’s heart swelled with affection as he watched Donna. He knew her feet would be swollen and tired tonight. He knew her wrists would ache from carrying heavy trays of food. He also knew she wouldn’t complain. Finally, the coaches finished their third cups of coffee and gathered the increasingly rowdy group back to the bus. They had several hours’ ride ahead of them. Such was the life of basketball players in rural Nevada. Amy insisted she’d bus the tables later. She gave Donna more than half of the tips and declared that Donna was done for the evening. As rough as Amy was and as much as she snarled at Mario, she really was a sweet girl, Alfred considered as Donna eased back into her chair. She slipped her feet out of her orthotic shoes. “Ooowhee, my dogs are barkin’ tonight,” she said, rubbing her stocking feet together. Alfred smiled at her. Even though they’d lived in Nevada for nearly 12 years, Donna still sounded like Alabama. It was music to his ears. “No problem, Hon’,” Donna said. She sighed and sipped her coffee. Alfred wanted to remark that the ‘kids’ were not much younger than Amy but he didn’t. “Where’s m’ baby?” Donna asked Amy. “Ain’t that somethin’?” Donna said. Then she seemed to remember Alfred and the late hour. “I guess I’d best git these ol’ bones home,” she said with a sigh. “Yes, ma’am,” Alfred said, standing up. Alfred helped his wife into her jacket, which was much too lightweight for the cold winter night. Alfred wanted to buy nice things for Donna. He wanted to buy Donna jewelry, a fancy trip, at the very least, a warm coat. Every winter she’d layer a hooded sweatshirt under another sweatshirt and top it with a lightweight coat that had been left behind in the restaurant for so long that Cindy, the restaurant manager, told Donna to take it. He wanted a nicer car (the one they drove was anything but nice with all its dents and rust—the rips in the seat were duct taped and the air conditioning didn’t work. It also burned oil but oil was easy enough to replace). That year, on St. Patrick’s Day, Alfred bet $20 on number 4 because his birthday was October 4. Donna bet $20 on number 16 because her birthday was May 16. They both put $300 on number 17, for luck. They ended up going home with $180, all of which they needed to apply to their rent. “Maybe our luck’s run dry,” Alfred said morosely as he put the car in reverse after it had stalled a few times. “Nah,” Donna said, “I still got you.” She reached over and took Alfred’s hand. The weather warmed and then finally got hot. All the remaining puddles from the spring melt disappeared as the dry wind blew. More families frequented The Owl Club. Most of them stopped at the fast food restaurants in Winnemucca or at McDonald’s by the freeway, but they still got a trickle of families in the summer too, they were on road trips. There were also more retired folks. They would come inside, squinting after being in the sunlight. They’d remove sunhats and sunglasses and after playing the nickel slots, they’d have a cup of coffee and a cup of soup. Then they’d climb back in their RVs and head down the road. Everyone seemed to be on the move in the summer. Alfred and Donna would sit on their small patch of grass (mostly weeds) behind their trailer on their days off. Donna would sit with her feet in a kiddie pool she’d fill up from the hose and Alfred would flip through his gun magazines. He didn’t actually own any guns but he liked gun magazines. They’d watch the traffic whiz by on the freeway. “Always rushin’,” Donna would say as the semi trucks and sports cars, minivans and moving trucks, sped by. “Beats me,” Donna would say. Summer dried to fall. The grass all turned brown and the leaves tumbled off the trees and blew away. The weather turned cooler and once again sports teams stopped at the Owl Club on their bus trips. The restaurant manager handed out pink ribbons as September wound to a close. Cindy’s cousin Lolene had breast cancer and Cindy was on a crusade to find a cure now, she said. Donna privately wondered to Alfred how her wearing a pink ribbon in a casino in Battle Mountain, Nevada would help but she didn’t say that to anyone else. She’d play along. What she didn’t admit, to even Alfred, was that Donna had felt a lump on her own breast. Wearing the pink ribbon pinned to her shirt seemed to add a weight to her chest. She knew she needed to get it checked. On Alfred’s birthday they were planning a trip to Winnemucca to the Winner’s Casino buffet. She’d try to get in with Doc Smith while she was there. Donna left Alfred at Wal-mart while she went to her appointment. He told her what she hadn’t wanted to hear and what she decided not to tell Alfred until later. She needed to have the lump checked, by a specialist, in Reno. The next months were a confusing round of doctor appointments and procedures. The chemotherapy caused Donna to shave her head before more of her hair fell out. She got a gray haired wig the nice lady at St. Mary’s in Reno had helped her pick out. It was itchy and hot and she only wore it to work. Donna insisted she could still work. The other waitresses gave her fewer tables and helped her with the orders on bad days. Sometimes Alfred noticed the waitresses leaving dollars on the tables in addition to what Donna’s customers had left behind. Alfred went through his days like he was in a dream. He lay awake so many nights worrying that he was in a constant state of exhaustion. He’d drink so much coffee during his shifts at the Owl Club that he was jittery all the time and he’d lost about 15 pounds because he had no appetite. Alfred would look at the bald head, the hollowness of his wife’s cheeks, see her struggle through her chemo treatments. He would never ever tell her this, but he hoped he didn’t look worse than she did. The days when Donna was in the hospital, recovering from her lumpectomy, Alfred slept fitfully in a chair in her room, drove the three hours to Battle Mountain for his shifts at the Owl Club, then drove the three hours back to be with her. Perhaps he should have taken the days off. Larry, the casino manager, would have understood. They needed the money though. Alfred was part of a union so he had insurance but it didn’t come close to covering everything. He had met with a financial adviser at St. Mary’s and she assured him that the hospital would erase part of the debt because of their low income level. Even without considering all the medical bills though, they were losing some of Donna’s wages and all the trips and meals on the road were adding up. It didn’t matter the cost though. Alfred fought his way through the long days and nights. Hearing Donna’s voice and seeing her warm smile and the firm way she lifted her chin when she was in pain carried him through the hard times. That winter was one Alfred would always remember even though most of it passed by without his notice. He saw Christmas decorations come and go. He bought a box of chocolates for Donna on Valentine’s Day even though she didn’t feel like eating them and gave them to Amy instead. Otherwise, he had no idea what day it was or what was happening in the world besides Donna’s treatments. At work he would take bets and engage in idle chatter with people but he wasn’t really paying attention. One day they were walking into the hospital for an appointment and Donna remarked on the weather. “Spring’s comin’,” she said. Alfred looked at her wrapped in her multiple jackets with the cast off coat on top. She’d lost enough weight that they all hung limply on her. Again he wished he could buy her a new coat. They would never get ahead. He glumly surveyed the sidewalk in front of him. Discouragement settled on his shoulders more heavily than it had all winter. Inside the waiting room he looked at his hands while Donna knitted and talked with the woman sitting next to her. Donna had taken up knitting to pass the time at all of her doctor appointments and the hours in the car between Battle Mountain and Reno. The only thing she knew how to make was scarves. She had made three scarves for Alfred, two for Amy and seven for Kenny. What a baby needed with seven scarves, Alfred wasn’t sure. Alfred rose when Donna did and followed her into the doctor’s office. He hadn’t heard them call her name. They sat across from Dr. Michaels. The doctor was smiling, but Alfred wasn’t hearing what he was saying. Instead, Alfred was studying the plant in the window. The plant was dying. It didn’t bode well for a doctor to not even be able to take care of a plant. Then Donna was smiling and she clapped her hands together, then reached over and grasped Alfred’s hand. “I guess you can’t get rid of me,” Donna crowed. She was happier than Alfred had seen her in months. He was still trying to process what had been said. Ordinarily they would have grabbed burgers at a drive thru but they felt like celebrating. They both decided they wanted chicken fried steak. They went to John Ascuaga’s Nugget in Sparks which was their favorite. When the waitress came to the table, Alfred noticed a green shamrock pinned to her white shirt. “Is it St. Patrick’s Day?” he asked wonderingly. Alfred smiled across the table at Donna, his best friend and the love of his life. Donna was cancer free. “Do you need more time?” the waitress asked, bringing them back to the present.